ICC Umpires Faces Patch for Cricket 07 Released. 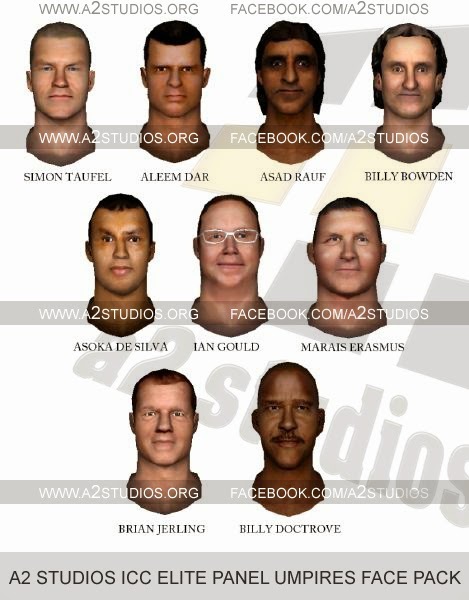 A2 Studios releases realistic ICC Elite Panel Umpires facepack for EA Sports Cricket 07. Download Free ICC Umpires Facepack for Cricket 2007. Make your EA Sports Cricket 07 Realistic with amazing creation by Ahad. These faces look 100% actual! Take any umpire.big file and rename it with following codes: White Umpire Code "8fee93d194de19802f8db9813cb2f036.big" Asian Umpire Code "9554f1f957d92c30606cf2c9fd71902f.big" And paste them to your EA SPORTS Cricket 07 Root Directory!